English poet and dramatist; born in London; died at Old Buckenham, Norfolk, Feb. 4, 1758; son of James Mendes, a stock-broker of Mitcham, Surrey, and grandson of Fernando Mendes. He was educated partly at St. Mary Hall, Oxford (M.A. 1750). Subsequently he engaged in stock-broking, and, having accumulated a fortune, he bought an estate at Old Buckenham, and devoted himself to literary pursuits. His first effort was "The Double Disappointment," a ballad-opera, produced with considerable success at Drury Lane Theatre, March 18, 1746, and revived at Covent Garden March 22, 1759. "The Chaplet," a musical "entertainment," the words by Mendes and the score by Boyce, scored a great success Dec. 2, 1749, because of both its merit and the clever acting of Mrs. Clive as Pastora. "Robin Hood," produced at Drury Lane Dec. 13, 1750, and "The Shepherd's Lottery," played Nov. 19, 1751, were not successful. 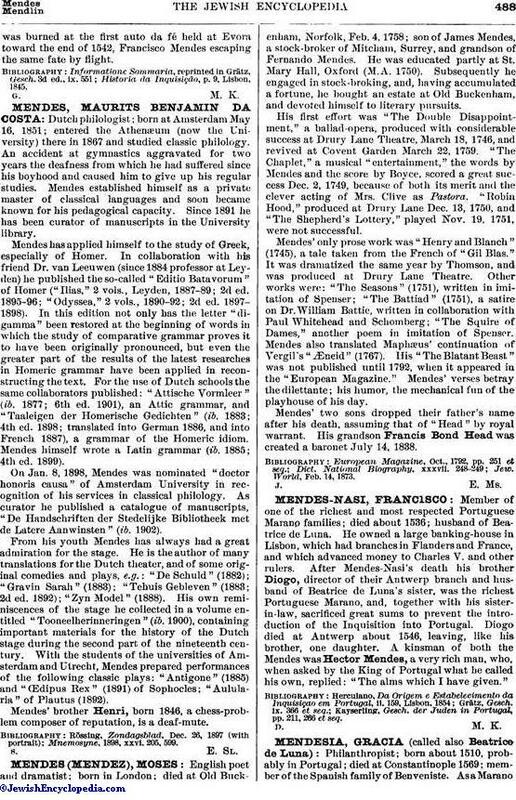 Mendes'only prose work was "Henry and Blanch" (1745), a tale taken from the French of "Gil Blas." It was dramatized the same year by Thomson, and was produced at Drury Lane Theatre. Other works were: "The Seasons" (1751), written in imitation of Spenser; "The Battiad" (1751), a satire on Dr. William Battie, written in collaboration with Paul Whitehead and Schomberg; "The Squire of Dames," another poem in imitation of Spenser. Mendes also translated Maphæus' continuation of Vergil's "Æneid" (1767). His "The Blatant Beast" was not published until 1792, when it appeared in the "European Magazine." Mendes' verses betray the dilettante; his humor, the mechanical fun of the playhouse of his day. Mendes' two sons dropped their father's name after his death, assuming that of "Head" by royal warrant. His grandson Francis Bond Head was created a baronet July 14, 1838. Jew. World, Feb. 14, 1873.